In a move to protect his totalitarian regime and subjugate the Venezuelan people, President Nicolas Maduro appointed Tareck El Aissami as his vice-president and successor. This appointment, made on January 4th, is not coincidental. 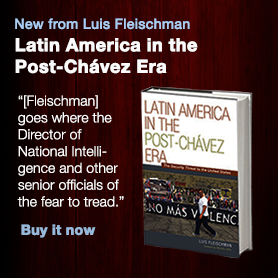 It comes at a time when the Venezuelan government is facing a huge crisis of legitimacy that can no longer be denied. Starvation, violence, and chaos now characterize Venezuela. Even the Vatican supported the call of the Venezuelan Church for civil disobedience and rebellion. The Vatican quoted the teachings of St. Thomas Aquinas who gave validity to sedition in the case of a government that is evil and does not deserve to hold power. As Maduro made the announcement, he pointed out that the reason why he brought El Aissami is because he is concerned about “citizens’ security”. Speaking directly to El Aissami, Maduro said “Get heavily involved, day and night, in the issue of citizens’ security and the need to purge local and regional police. Be ready terrorists, we are coming strong”. This means that El Aissami is coming not to restore citizens’ security but to eliminate the last bastion of resistance to the powers that challenge the tyranny of the Maduro government. El Aissami has been the governor of Aragua state for the last several years; the most violent state in the country. Restoring security is not really his forte. Furthemore. El Assami, like Maduro, belongs to a sector of chavismo the ruling elite called “The Francisco Miranda Front“, which is the pro-Castro sector. This also reflects tensions between Maduro and other sectors of the regime, incluidng the military groups that joined Hugo Chavez in his failed coup d’etat of February 4, 1992. (the group is known by the term 4F) . Tensions between the 4F and Maduro emerged as a result of the deteriorating economic situation and scarcity the country is suffering. A group of officials asked for the resignation of Mr. Maduro. This means that the regime is losing the support of the military. Against this background we may speculate why El Assami was appointed. El Aissami has been a key liaison between Venezuela and Iran and Hezbollah for many years. As head of the office of Immigration (ONIDEX) and Minister of Interior he provided passports to individuals from the Middle East; mainly Iranians. Iranian presence in Venezuela includes Hezbollah and the Iranian Revolutionary Guard. Their presence is part of the military philosophy of the Chavez regime that sought to develop a defense strategy by using guerilla warfare. In practice, what it means is the protection of the regime in the same way that revolutionary guards protect the Ayatollah and in the same way that now Hezbollah is fighting for the survival of the Assad regime in Syria. Hezbollah and the Revolutionary Guards are training soldiers of the revolution in camps in Venezuela and also in the ALBA school, located in Santa Cruz. El Aissami played an important role in all these connections that also include money laundering operations and dealings with drug cartels. Venezuela’s ports and airports are being used freely by drug cartels. Therefore, it makes sense to assume that the move to appoint El Aissami is to increase repression by mobilizing all these elements. There is a chance that the Iranian repressive apparatus will join the Cubans to secure the survival of their Venezuelan ally. This could mean confrontations not only with civil society but also with potential insurrected military officials. This is likely to increase Venezuela’s dependence on Iran. In addition, it is also likely that the presence and influence of Iran will increase in Venezuela and elsewhere in the Western Hemisphere. In addition, it was disclosed that the Venezuelan embassy in Baghdad sold passports to anyone. It can be assumed that Sunni terrorists may have acquired those passports. El Aissami’s father was the representative of the Iraqi Baath party in Venezuela. Former Sadam Hussein operatives and officers are an integral part of the Islamic State. Therefore, the possibility that Sunni extremists may increase their presence is real as well. Let us remember that most recently, U.S. Southern Command reported that 10% of those crossing the Southern border are of Sunni Arab origin. It is not clear to what extent these two facts may be related but it is worth further exploration. The Venezuelan government is a nightmare for its own population and the world seems to think it is not their business. Now, with the appointment of El Aissami, a man associated with terrorism, drug trafficking and corruption this situation should be of even greater concern to the U.S. and to the region. 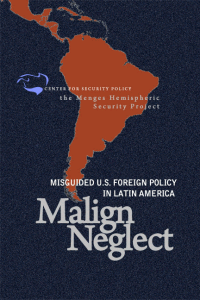 Without some direction from the United States and certain Latin American countries like Brazil, Argentina and Colombia, the Maduro regime will continue to be a serious security threat as well as a bastion of criminality and lawlessness. This is the time for the United States to build international support and particularly in the region impose sanctions to every single political, military and para-military leader that supports the Maduro government. Since we have inherited from President Obama a process of normalization with Cuba, it would be very convenient to apply some pressure on the “friendly“ Castro Regime to stop supporting the Venezuelan regime. As we pointed out, Cuba offcials are currently heavily involved in the survival of the Venezuelan regime. The Venezuelan situation is so chaotic that civil war is likely to erupt at any time. Such scenario could have regional implications. The current government of Venezuela is no longer popular with many Latin American countries that once supported the Bolivarian Revolution like Brazil and Argentina. Some time ago the South American trading block known as Mercosur suspended Venezuela from its’ membership. The Trump Administration has now an opportunity to change policy and develop an entire new diplomatic, economic and political strategy aimed at reducing the influence oft he Maduro-El Assami regime. It is the right thing to do and it is in our security interest.